The ‘lite’ version of GQueues is free and provides enough functionality to be used for individual task management. The paid version costs $25 per year and adds full team collaboration, integration with Google Calendars and access to mobile versions for the iPhone and iPad and Android phones and tablets. GQueues was developed by Cameron Henneke, a private developer, and is not owned by Google. For this review I have tested GQueues using Internet Explorer 8 on a Windows XP desktop; and Safari on an iPad 2 and on an iMac running Lion. The app warned me that IE8 was not a recommended browser, but worked regardless. The building blocks for GQueues are folders (called ‘categories’), task lists (called ‘queues’) that sit inside those folders; and tasks. In setting up GQ, I have used categories to separate areas of my life (such as work and personal) and queues for single tasks and projects within each of those areas. Tasks can be entered by clicking the ‘add task’ button (see screenshot below) or by using a keyboard shortcut. You can also send a task to GQ by email or install a GQ ‘add task’ button in your browser and GQ will insert the URL of the page you were visiting in the notes field of the task. The task entry line brings up icons that let you schedule or assign the task, or add a tag or a note. Notes are single-line by default but you can insert extra lines by clicking shift + enter in the notes field. While you cannot attach any files to a task, you can insert in the note field a hyperlink to a note in Evernote or a document in Google Documents. The free version of GQ allows you to create repeating tasks, but you will need the paid version to receive a reminder. It is great to see more and more developers provide the capacity to use nested tasks. 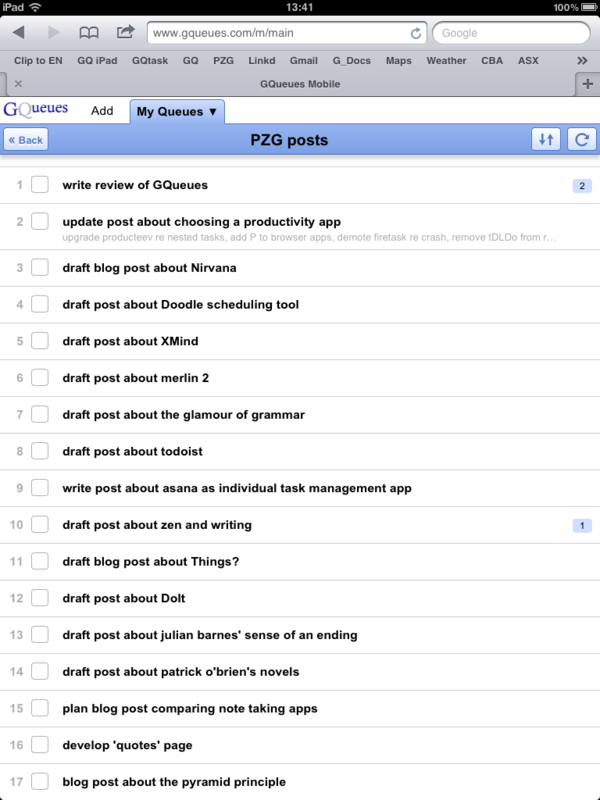 Like Omnifocus, GQueues provides multiple levels of indentation (ToodleDo, ToDoist and Producteev provide just the one). Queues and tasks (including those with subtasks) can also be duplicated. This is handy if you want to create a template for recurring processes in areas such as recruitment, reporting or publishing. 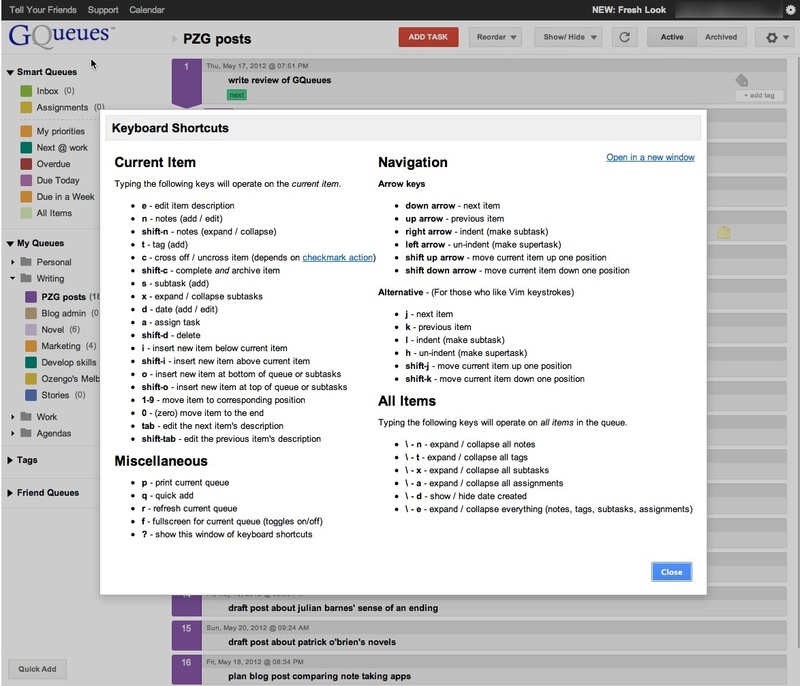 It is easy to sort your task lists in GQueues. You can drag and drop tasks or sort them by name, due date, date created or tag. You can also reorder tasks or indent them using keyboard commands. Typing a question mark while in GQueues brings up a summary of keyboard shortcuts (see screenshot below). The GQ navigation pane contains some ready-made smart lists, such as ‘overdue, ‘due today’ and ‘due in a week’. The app also lets you create smart lists of your own. For example, I have created a ‘my priorities’ smart list, which shows the next action for every task list in my ‘personal’ category. Using a similar tag-based query gives me the ‘next @ work’ list, which I check every morning. These powerful query features and the well-executed tag system make it easy to adapt GQueues to a GTD-based workflow. 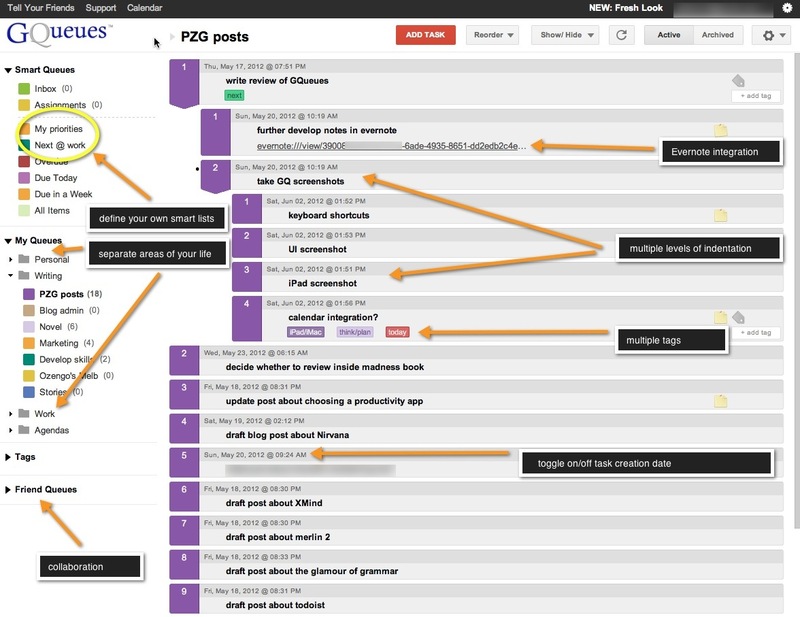 The central inbox can be used as the receptacle for all incoming tasks and ideas, which can be reviewed and dragged into the relevant queue for action. Multiple tags can be used to flag task context (e.g. phone, email, errand) or status (e.g. next, waiting, on hold, someday). You could also set up a category to track your top-level goals. You may be interested in watching a video on setting up GQueues for GTD. The fully featured version of GQueues costs $25 p.a. and is required to support full team collaboration. The paid version also provides reminders, access to the mobile versions (for iPhone, iPad and Android) and integration with Google Calendars. You can drag and drop entries, or change the task duration in GCal and your changes will carry over to GQueues. The GQ mobile apps are browser-based; not native apps that you download from the App Store. The screenshot below, from the GQ iPad app, shows the simple but functional interface. The app works well, including when you are offline. So how does GQueues stack up against other leading productivity apps? I believe that GQ provides a compelling alternative to ToodleDo. It is very similar to Producteev, but provides multiple levels of task dependency, as well as easier and faster access to the various areas of your work as you don’t have to go back to a central ‘switchboard’ to select another category. Producteev, on the other hand, lets you attach files and multiple notes. Omnifocus provides more flexibility in adding web clippings and files, as well as the capacity to hide from view tasks that are not yet available – but no multiple contexts, calendar integration or team collaboration. Zendone, Things, Nirvana, Nozbe and Remember the Milk offer no nested tasks. Do you have a headache yet? All of the apps mentioned above have many strengths, as well as some limitations. So much depends on your personal expectations and work style. GQueues may just be the app that lets you plan the various areas of your private and working life without confusion and cross-overs, with just the right balance between functioniality and ease of use. This entry was posted in productivity and tagged GQueues, GTD, iPad, nirvana, nozbe, omnifocus, producteev, productivity, RTM, things, to do app, toodledo, zendone by Gilbert Van Hoeydonck. Bookmark the permalink.